One of the reasons may be that the unique nasal features they discovered aren’t preserved in most Neanderthal skulls. Of the 20 Neanderthal skulls the anthropologists looked at, they found the structures in only eight--the relevant parts of the nasal sections of the other skulls had been destroyed. But in those eight, Schwartz and Tattersall saw two triangular bony projections jutting into the front of the nasal cavity from either side. They have not found these features in any modern human skulls or in the skulls of other ancient human ancestors. Jeffrey Laitman, an anatomist at Mount Sinai Medical Center in New York who has been studying Neanderthal anatomy, thinks the bony structures probably helped Neanderthals breathe the cold air of Ice Age Europe. The jutting projections, Laitman suggests, could have provided more surface area on which to lay down mucosal coverings to warm and humidify cold, dry air before it reached the throat and lungs. Previous studies have suggested that the large sinus cavities of Neanderthals served a similar function. Laitman thinks that Neanderthals breathed more through their noses than modern humans do. From reconstructions of their upper respiratory tract, he has proposed that the Neanderthal larynx was higher up in the throat than it is in modern humans. This probably would have constricted the area behind the mouth, preventing Neanderthals from gulping in cold air and drying out the delicate tissue of the throat and lungs. A high larynx, says Laitman, also suggests that Neanderthals couldn’t make the same range of sounds that we can, since a lower larynx allows for a larger sound-modifying airspace above it. Tattersall and Schwartz believe that their discovery of yet another basic difference in Neanderthal anatomy supports the view that Neanderthals and modern humans are separate species. In fact, they say, Neanderthal nasal anatomy not only sets Neanderthals apart from other humans but is unique among all primates. Milford Wolpoff, an anthropologist at the University of Michigan, bluntly disagrees with Tattersall’s interpretation. They’re very intelligent scientists, but they’re wrong. The differences they found show that Neanderthals are a race of human beings, Wolpoff says. All races have features that are distinctive. In reply, Tattersall says that the nasal structures he and Schwartz discovered lie beyond the range of variations you would expect to find within a single species. He shrugs off opposing arguments, saying it would take nothing short of a nuclear explosion to convince many anthropologists that Neanderthals should be classified as a separate species. Some people still have a notion that Neanderthals ought to be explained as some weird variation of species that we know today, Tattersall says. Paleoanthropologists have had a lot of trouble letting go of this notion, but they should. Humans are no different from other living forms in having an evolutionary history of diversification. Issues of classification aside, the Neanderthals’ highly specialized noses could have been a drawback once Europe’s climate warmed. In my work, says Laitman, we’re acutely aware that sinus infections can be devastating. In warm weather, a cavernous, sticky sinus might have been fertile ground for infection. I wonder what type of pressure Neanderthals would have been under, with absolutely huge sinus systems. How would that relate to upper respiratory infections? Could that have been a great problem for them? These are all very tantalizing questions. Scientists used 3D geometric morphometric techniques to superimpose the configuations of 15 landmarks measured on skulls of different species in order to measure the degree of variation between them. Pictured are a Neanderthal landmark configuration (red) superimposed over a modern human one (green). The data used included Neanderthal fossils, Upper Paleolithic European modern human fossils, and recent human populations, as well as data from living African apes and Old World Monkeys. Over 1000 skulls were included. A new study indicates that Neanderthal craniums differ so greatly from those of modern humans that they constitute their own species, and are probably not our ancestors. Neanderthals lived in parts of Europe and Asia as long as 200,000 years ago. They were more heavily built then we are - imagine the "cave men" you frequently see on TV and movies. When more modern humans began to show up about 40,000 years ago, the Neanderthals started disappearing... and there's been a debate raging between anthropologists for decades over whether they evolved into modern man, or went extinct as the new guys took over their territory. To resolve the debate, NYU paleoanthropologist Katerina Harvati used a technique called geometric morphometrics to measure the variations between various primate species. They picked certain features on fossil skulls and compared the distance between them, learning how big the variations can be within members of a single species, or from one species to another. What they found was that the differences measured between modern humans and Neanderthals were significantly greater than those usually found between populations of a species, and that the difference was as great or greater than that found between closely related primate species. Conclusion: Neanderthals were a distinct species, and did not evolve into modern man. This theory aims at giving a credible explanation for why up to 10% in some parts of the world are classified by psychiatry as disordered. Psychiatry themselves has long been on the wrong track, and lack any coherent theory. Some other people in our society like to put all the blame on the parents, and this has caused considerable harm to many families. Recently, some researchers have shown the large amount of genes contributing to these proposed disorders, as well as providing links between virtually all disorders. It's also very clear that there doesn't exist any clear border's between various diagnosis, nor to normality. The main problem seems to be in the area of social relations. After a closer study of the topic, it's clear that the social problems are not defects. They are simply different functions, lack of function and sometimes additional functions. The problem is how to explain this in an evolutionary model. Differences in innate, social behaviors are very big disadvantages. They can only develop in isolation. Long isolation. All this lead me to study our history. The only isolated population in recent times, that had been isolated for a long time, was Neanderthals. Closer study of them revealed that anthropology wanted to make sure to exclude them from our gene-pool. However, the reason for this is obscure. The reasoning is only based on phylogenic analysis of mitochondria-DNA. The archeological evidence isn't conclusive, rather it indicates both species cohabitated for a long time in Europe. Evidence is also based on most alleles being more diverse in Africa. However, the more you think about it, the less sense it makes. If two species cohabitate for millennia, it's not very likely hybrids were frequent, and that in turn means mitochondria-DNA of the minority-contributor would be eliminated by genetic drift. Even worse, diversity was reduced by the last ice-age maximum, that caused dramatic movements and most probably a major bottleneck in Europe, but not in Africa. Closer study of European origin diseases and alleles also reveals that many alleles has originated in the period when modern humans and Neanderthals lived side-by-side in Europe. The DRD4 7R allele is associated with ADHD, and a study reveals it originated at this time. Many other properties of psychiatric disorders seems to be either attributable to Neanderthals way of life, or can be seen as winter-adaptations. The conclusion we can draw from all this, is that psychiatric disorders are no disorders or dysfunctions, rather the remains of a hybridization with Neanderthals. This should switch our current attitude from disordered to perfectly functional. It should also lead to better understanding, and new studies that will research exactly what is different. 1. What was the sample size? If the Neanderthal sample size is too small, even assuming one population for 250,000 years of Neanderthals, then the study is flawed. There are statistical formula for determining a statistically significant size. 2. Sapiens noses. I hate to say this but nasal cavities even in skulls are extremely nasty to look into. Nobody does it. As a result of this what is the sample size of the sapiens used? It is probably also small. How do Caucasoid nasal cavities compare with other races? This is an important question. 3. Recostruction of sub-adults: Nobody likes to do this because features change with age. We have discussed this concerning typing at Skadi. Everybody likes a young adult, about 25 years or so. 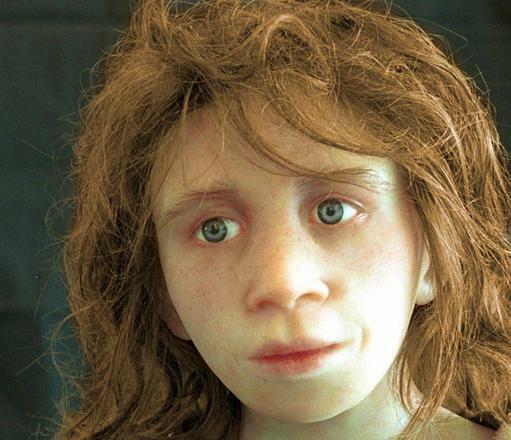 Neanderthals had very broad and long noses--huge noses, not the convex nose in the reconstruction shown above. The big problem in comparing the long, low, rearward bulging skulls of Neanderthals and the shorter, higher skulls of sapiens is that everybody recognizes that the real difference is the sphenoid bone. The sphenoid is at the very base of the brain, behind the jaw. Neanderthals had flat sphenoids. Sapiens have bent sphenoids. A bent sphenoid means a bent brain box--it is folded around on the sphenoid as if you took a loaf of bread and pushed on both ends, bending it in the center. One single mutation relating to skull developement could be responsible for bending the brain box at the sphenoid. This mutation could define sapiens from neanderthal. With the Neandertal brain box bent, the brow ridges would run vertically upward forming a forehead. Check your forehead--it is a very thick bone. The brain box would become shorter and higher all at once. So, using skull shape to determine sapiens/neanderthal species difference all depends upon the assumption that one a few controlling genes are not responsible for the difference in skull shape. This is an assumption and may or may not be valid. Acne is my favorite. Acne occurs during puberty, especially in males, as the hormones change from child to adult. Races have differences in hormone balance. This would have been even more true for Neanderthals. Neanderthal ancestry might result in a hormone change at puberty of really epic proportions and may result in extreme acne. My observation is that Caucasoids, especially of Northwestern European ancestry have the worst cases of acne. My observation is that Caucasoids, especially of Northwestern European ancestry have the worst cases of acne. As far as I know thick skin is more prone to oiliness and acne; and usually people with olive or darker skin tend to have thicker skin. It's not always the case of course, thick skin in Europeans it may well be an UP trait, when I think of it, what with all the Ice Age and climatic hardship that went on. Just speculating here though, and I know statistically that thin skin is prone to dryness and/or sensitivity and thick skin to oiliness and acne/enlarged pores. Thick, oily skin also has the advantage of not getting age lines too easily or early, I guess that's why the blacks look much younger than their actual age.